I can’t begin to say how delighted I am that this interview with José Kozer I conducted in 2015 is now available as a book. 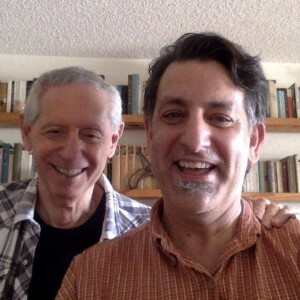 I so wanted to post as much of this material as possible because it may be the most extensive interview ever conducted with the 2013 Neruda Prize-winning poet, but here it is, available via Ranchos Press out of New Mexico. Thank you José and thank you publisher/translator Amalio Madueño for this beautiful addition to Kozer studies. 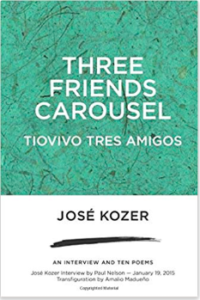 Three Friends Carousel (Tiovivo Tres Amigos) is the transcript of an interview conducted with Neruda-prize winning poet José Kozer at his Hallendale Beach home over two days, January 18 and 19, 2015, by Paul Nelson. 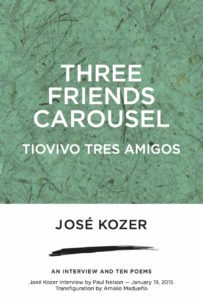 The wide-ranging conversation delves into Kozer’s main three books translated into English: Stet, Anima and Tokonoma, as well as how he ended up leaving Cuba, his thoughts about the warming of relations between the U.S. and Cuba, the deepening of his work because of his voracious reading and writing practice, how poems come to him quickly in the moment, his use of parenthesis, the ant as a recurring symbol in his work, spirituality, how he was Bob Dylan’s bartender for three months in 1963 in Woodstock, New York, his notions about the seriality of his work and how to curse properly as a Cuban, among other topics. 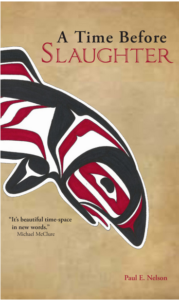 Nelson, a deft interviewer who has conducted over 500 interviews, mostly with poets and authors, displays a keen sense of Kozer’s work and creates an environment in which Kozer is purely his authentic self. 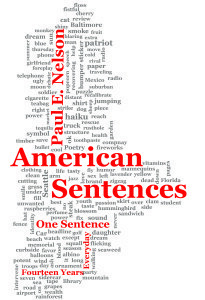 Amalio Madueño adds translations of ten new Kozer poems, published in Spanish and English. JOSÉ KOZER: Born Havana, Cuba (l940) of Jewish parents who emigrated from Poland (father) and Czechoslovakia (mother), left his native land in 1960, lived in New York until 1997, year in which he retired from Queens College as Full Professor, where he taught Spanish and Latin American literatures for thirty-two years. After living for two years in Torrox (Málaga) Spain, he moved twelve years ago to Hallandale, Florida, USA. His poetry has been partially translated to English, Portuguese, German, French, Italian, Hebrew and Greek, has been widely anthologised and has appeared in numerous literary journals from all over the world. There are several master and doctoral dissertations written on his work, as well as full chapters written (and being written) in several MA and PhD dissertations. His work has been studied in many graduate and undergraduate courses. On José Kozer´s poetry there was a Symposium held in 1997 at UCLA (Irvine) which was organized by Prof. Jacobo Sefamí, out of which a full length book was published by UNAM University in Mexico City under the title La voracidad grafómana: José Kozer. ALDUS (México) published two books of prose by José Kozer: MEZCLA PARA DOS TIEMPOS and UNA HUELLA DESTARTALADA, and ACTA (2010) a book of poems written upon the death of the poet’s mother. A new reissuing of BAJO ESTE CIEN, originally published by Fondo de Cultura Económica de México (1983) was published in Barcelona by editorial EL BARDO. Fondo de Cultura (México) published his ÁNIMA; Visor (Madrid) his Y DEL ESPARTO LA INVARIABILIDAD and Monte Ávila (Caracas) his TRASVASANDO. JUNCTION PRESS, NEW YORK, published a bilingual (Spanish/English) anthology of Kozer’s work entitled STET, edited & translated by Mark Weiss. Shearman Editorial (England) published a bilingual edition of ÁNIMA translated into English by Peter Boyle. In Havana, Cuba, Torre de Letras, an independent small press, just published his latest book SEMOVIENTES. Kozer Graduated with a B.A. from New York U. in 1965, received his M.A. and PhD from Queens College, CUNY in 1970 and 1983 respectively. 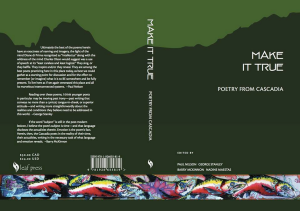 His poetry has been anthologized in the past year (2010) in some of the most important anthologies in the world, Norton, Gallimard (France) and Oxford University Press (England). 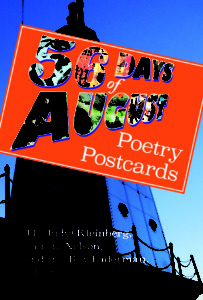 It has also appeared with Fischer Verlag (Germany) where only fifteen poets of the Latin American 20th Century appeared. He is the recipient of the Premio de Poesía Iberoamericana Pablo Neruda (Chile) for 2013. 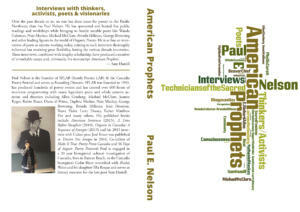 This entry was posted in Uncategorized and tagged Amalio Madueno, Jose Kozer, Ranchos Press. Bookmark the permalink.